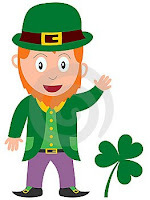 GEORGETOWN RUNNING CLUB: St. Patrick's Day EVE - Ri Ra in Bethesda! I have a job interview tomorrow at 4 PM but might celebrate afterward... and/or before. I'd probably give a better interview after a Guinness anyway. I'll be there celebrating my heritage! I hope the Patricks attend to celebrate their namesakes' holiday. I should have said "O'Klim"
I am running with Bain and Reaves at 6:30 but will pop in after.